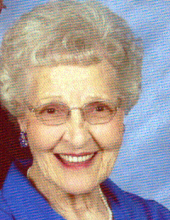 Mary Elizabeth Stark, age 94, passed away on April 8, 2019, at her home in Paragould, Arkansas. Mary was born in Jonesboro and was the daughter of Leroy and Partee (Brumley) Watkins. Mary was the beloved wife of Rudy Stark, who passed away on February 17, 2017. During her life Mary cherished her role as a homemaker and was an excellent cook who shared with her husband a love of travel, antique cars, and spending time with family and friends. She enjoyed being an active member of First United Methodist Church for many years, the Greene County EHC, and the Arkansas Antique Car Club. Mary was a loving mother and Grandmother who leaves behind a family who will miss her ready smile and welcoming presence. Mary truly was a steel Magnolia who believed that a smile and a prayer could get you through the hard times. Mary is survived by her daughter, Beverly (Stanley) Meredith, her grandchildren Debbie (Michael) Lemoine, Wendy (Terry) Rogers, Penny Dearin, Jennifer (Michael) Barber, Don (Kim) Meredith, and Dylan Hewlett and 20 great grandchildren. Mary was preceded in death by her husband, Rudy Stark, two brothers, Leroy Watkins, Jr. and Gene Ryan Watkins, step daughter Vivian Cash and grandson, Sonny Harris. The service will be held Monday, April 15 at Heath Funeral Home in Paragould. Visitation will begin at 11:00 AM and the service will be at 1:00 PM. The family would like to express our gratitude to AMMC Home Health and St. Bernards Hospice and Dr. Bobby Thompson for their care and special attention during the past two years. A very SPECIAL THANKS to our wonderful caregivers, Pat, Charlene, Donna, Helen, Linda, Debbie and Carolyn. Grandsons will serve as Pallbearers; Chris DeFries, Duran DeFries, Mason Dearin, Koby Harris, Dylan Hewlett and Scot Hewlett. Memorial donations may be made to First United Methodist Church, Paragould. To send flowers or a remembrance gift to the family of Mary Stark, please visit our Tribute Store. "Email Address" would like to share the life celebration of Mary Stark. Click on the "link" to go to share a favorite memory or leave a condolence message for the family.